The practical application of any building material presupposes the existence of a certain set of special devices. In particular, without a tool for drywall and profiles, it is impossible to imagine the creation of an arched or partition construction, as well as the construction of more complex elements of gypsum boards. 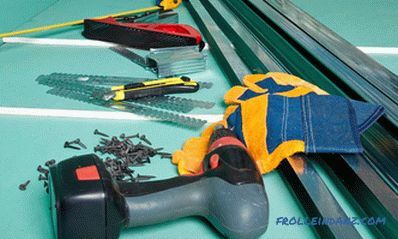 From this article you will learn what types of tools you may need in the process of working with plasterboard, what is their purpose and how to use them. When working with a cardboard, it is not very convenient to perform certain actions, since massive slabs often have to be moved from one place to another . 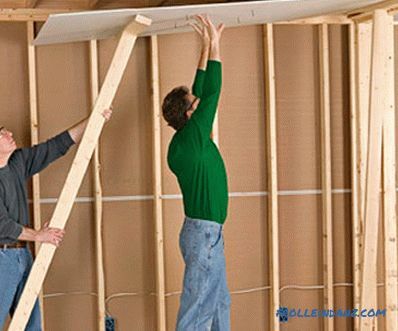 Also, certain difficulties may arise in cases where it is necessary to keep the material being mounted at a height. Special devices which are used by many professional masters help to cope with similar tasks. There are pod models that are designed to work in pairs or for one person. In the first case, a set of two handles is used, which allows you to grip the gypsum at the required height and gently move the material, holding it in the desired position using your free hand. For work performed alone, it is designed to be made of plastic or metal, due to which the sheet is reliably fixed. 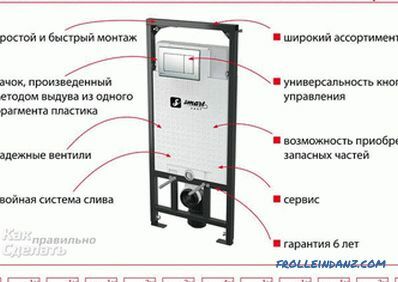 Such a device is convenient to use at home, if the repair is carried out without the involvement of assistants. 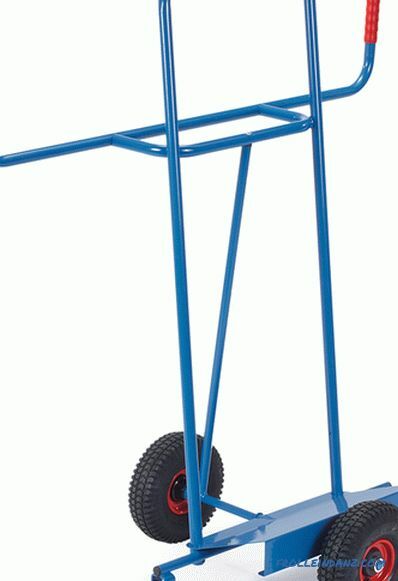 For transporting drywall in a large construction site, it is advisable to use a cart on which you can load up to 400 kg of material. The length of such a device is usually about 1.2 m, and the width is not less than 0.6 m. If necessary, transport the sheets and place them on the edge, keeping a small angle of inclination. It should be noted that the larger the diameter of the wheels of the cart, the easier it is to transport over the territory not cleared of debris. 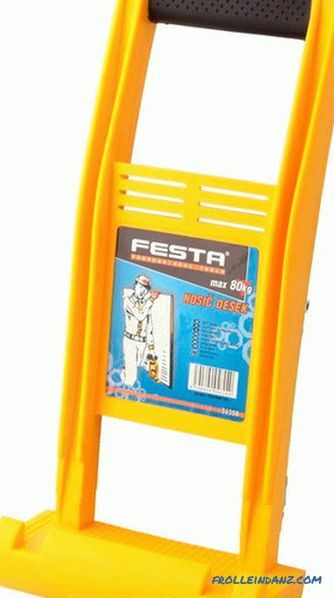 This tool for working with plasterboard is a device in the form of a lever located on the stand, which is equipped with a metal movable stop needed to hold the material. In the process of wall cladding, as well as creating niches and partitions, such a device ensures the vertical position of the sheet, which is attached to the profile. At the same time, the integrity of the lower edge of the mounted plasterboard is maintained. 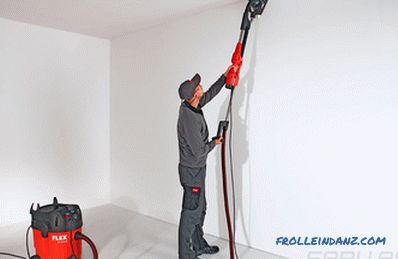 Allows you not only to quickly fix sheets in the wall covering process, but and press drywall to the ceiling. 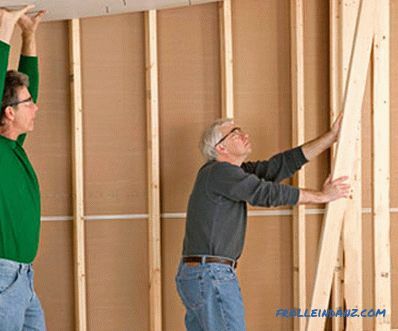 However, without the help of a partner, it will be difficult to mount the drywall, since such a structure restricts the movement of the master. 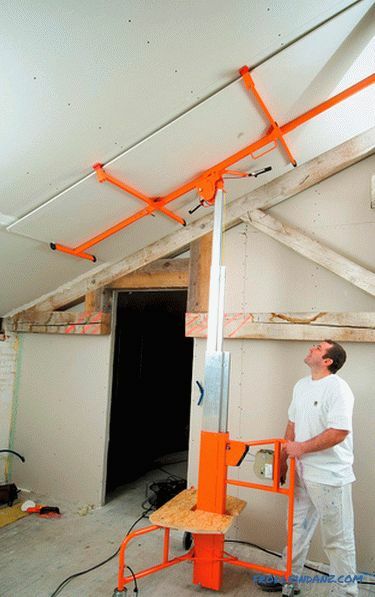 For some complex work, in particular regarding the installation of ceiling structures or ventilation elements, the ideal option would be to use such a mobile device as a frame lift. With it, you can move and install sheets both vertically and horizontally. 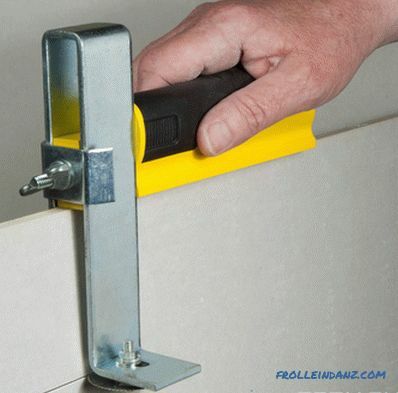 Such a tool for mounting a hypocardboard allows you to securely fix the material on the frame, which is especially convenient when creating solid suspended ceilings. The lift is equipped with wheels, due to which the movement of the gypsum board takes place almost without effort, which in turn has a positive effect on the quality of installation. The total weight of such a device is usually about 26 kg. 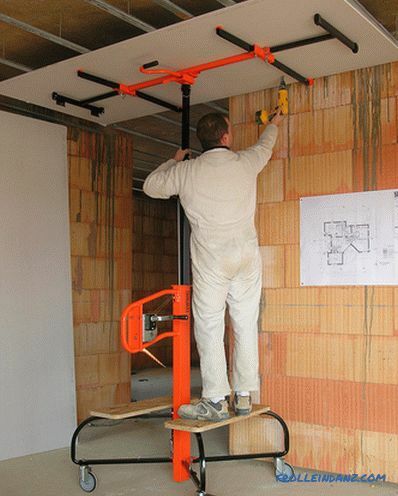 At the same time, it can be used in work performed at a height of up to 3 m. The maximum allowable weight of materials being moved is 50 kg. Mount sheets of drywall, having at the disposal of such a device, it may well be one person, without attracting assistants. Some specifications of models offered by different manufacturers may vary slightly. In addition, there is such a device as a lift-strut. It is mainly used in work with suspended ceilings. With a limited budget, not every home artist can afford to buy a special device. 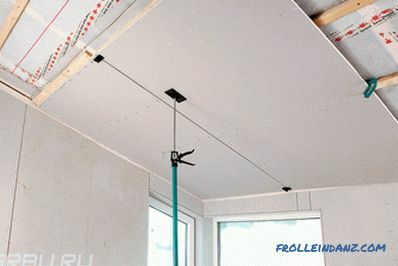 However, to qualitatively mount a solid suspended ceiling without ancillary equipment will be quite difficult. In this case, it makes sense to independently make T-shaped supports in the amount of two pieces. The length of the rack of such a product is determined on the basis of the height of the room so that it is possible to ensure a tight fit of the material to the ceiling. Such devices masters successfully used before the first lifts appeared on the market. During the installation process, the presence of a partner is assumed. High-quality installation of the gypsum board assumes that there is an exact markup and preliminary measurement of the material. The classic tools include roulette, level, plumb. However, there are also quite a few modern devices, which make it possible to significantly speed up the process and achieve better results. Consider what devices are used by experienced craftsmen today. This is a well-known measuring instrument, the body of which is made of plastic or metal, and inside is a measuring tape. The most commonly used roulettes are 3 m long. 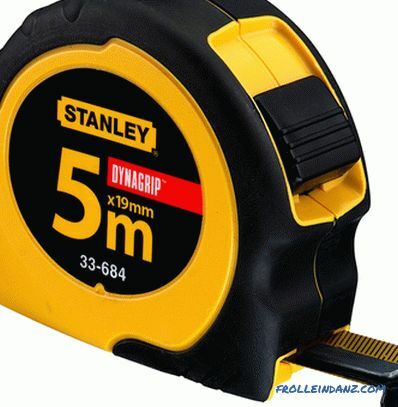 However, to perform various lengthy measurements, it is better to have a five-meter tape measure. 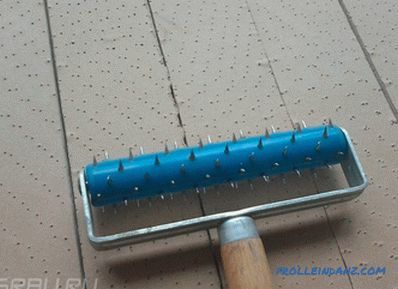 This tool, used to work with plasterboard, allows you to control the slope of any vertical or horizontal surface. The product consists of a metal case with an ampoule built into it (there may be several of them), which is filled with an alcohol-containing liquid having a certain color. The angle of the base or component is determined by the air bubble inside. 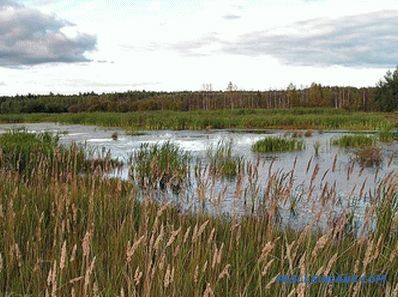 When the surface is ideally flat with respect to the ground, it should occupy a middle position, without going beyond the limits of the existing marks. Modern manufacturers offer a variety of models of levels of various sizes. Their differences may lie in the number of built-in tubular indicators, as well as their location. Some products are equipped with magnets, which is convenient when aligning elements of metal structures. Devices with laser pointers, which allow for fast marking, are particularly popular. 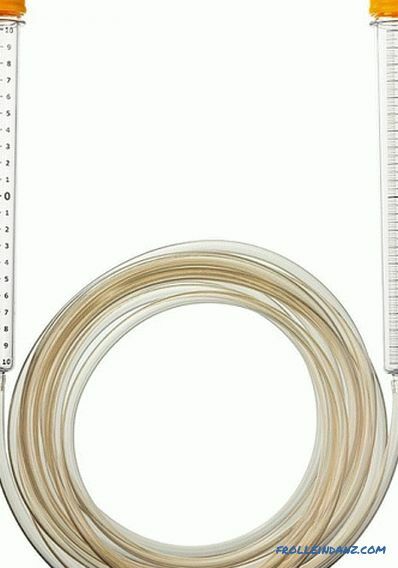 A sliding tool equipped with a measuring scale and a bubble level, the length of which can reach 3 m. With its help you can control the horizontal and vertical position of the structure. In addition, there is a special nozzle designed to hold the gypsum board in a vertical position during installation work. Allows you to split horizontal planes, as well as transfer marks from one surface to another. 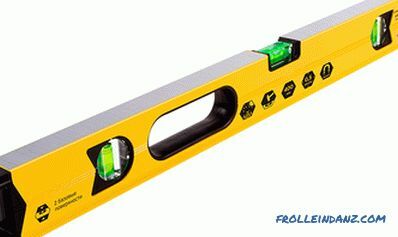 Predominantly hydraulic level is used in work with suspended ceilings. 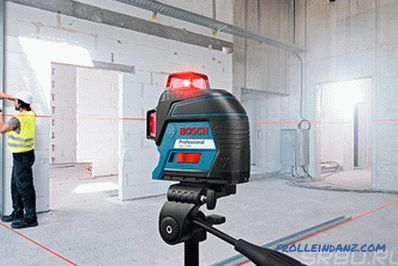 Marking lines are defined using a hose, the length of which, as a rule, is not less than 10 m.
With the help of modern measuring equipment achieve almost perfect results. 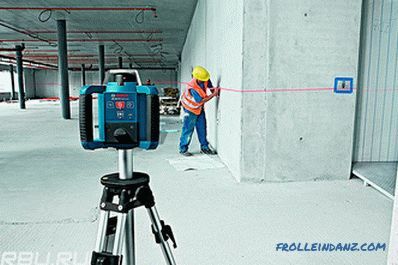 One of the devices widely used in the work with plasterboard is a linear laser level (plane builder), which allows by means of mutually perpendicular beams to construct projections both vertically and horizontally, which makes it possible to perform qualitative marking of absolutely any plane. This device, operating in different modes, allows you to set vertical, horizontal and inclined planes. The laser beam in such devices constantly rotates around its axis. Thus, he is able to project a plane on 360 0 . These devices are convenient to use when working in large rooms. 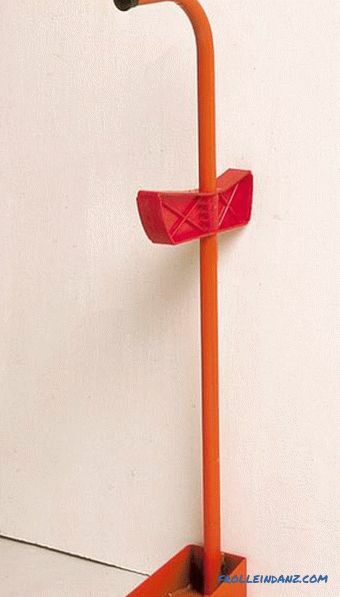 This tool is primarily used to mark the corners. 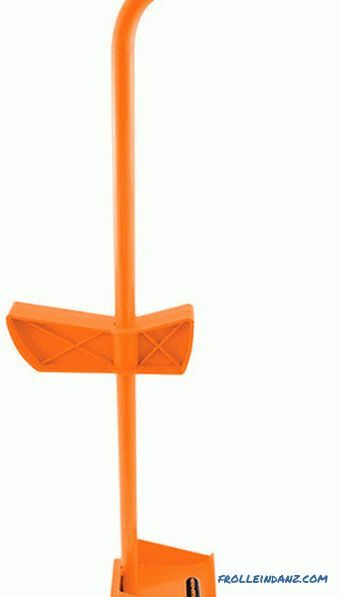 Structurally, the device is quite simple and is a ruler of a certain length, mounted in a metal base. With it, you can also control the squareness of certain elements. 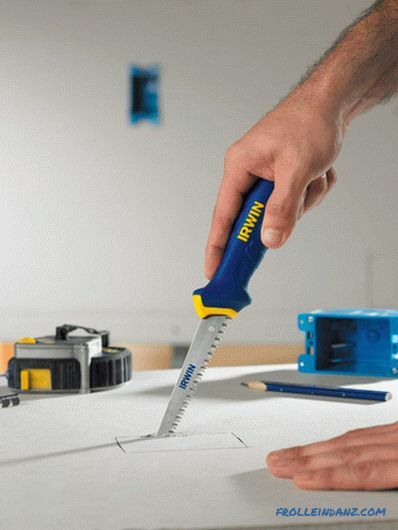 There are a number of tools and fixtures used for cutting and processing plasterboard sheets. This device consists of two support legs with stop elements attached to them. A grid cover is located on top, on one side of which a clamping ruler of the appropriate length is fixed by means of special clamps. 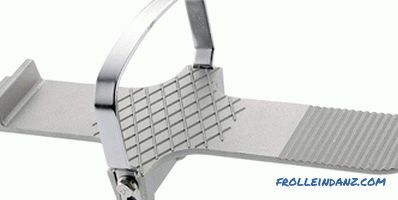 Not less convenient device, the main difference of which is a removable cover, which allows, if necessary, to fold the support frame for the purpose of subsequent transportation. For this purpose, special loops are designed, which are located on the end rails. The material is cut using a construction knife or a cutting tool intended directly for drywall. 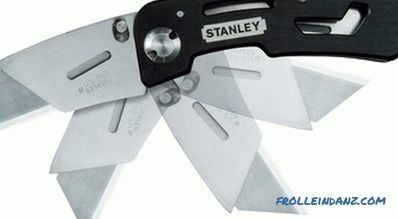 Special knives are used to trim the upper GKL cardboard layer. The device is necessary so that you can cut a strip from the full-size sheet, the width of which does not exceed 120 mm.This cutting is carried out by two discs, simultaneously cutting the material from both sides. Some models of such devices are equipped with an additional handle, which makes them more convenient to use. 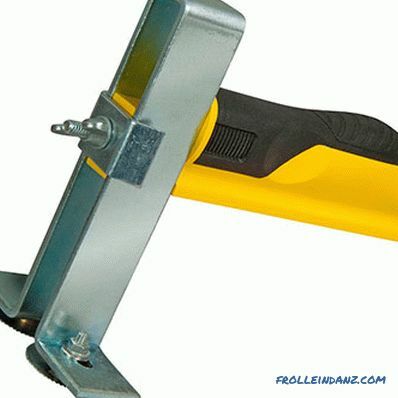 Acts on the same principle, but is used to cut larger pieces of drywall. The allowable width of sheets in this case is 630 mm. At the same time, cutting with an ordinary knife yields almost the same results, which accounts for the relatively low demand for such devices. To create rectangular holes or elements with complex shapes, you will need a hacksaw with a minimum web width and fine teeth. Such tools are made specifically to work with GCR. 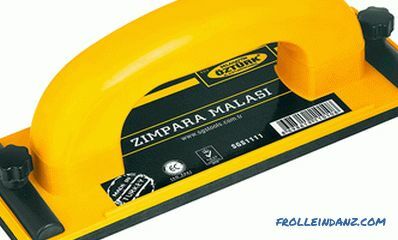 The tool is a type of rasp that can be used to cut the edges of trimmed sheets, making it possible to align them and achieve perfect smoothness. The tool involves the use of interchangeable webs, the installation of which is carried out by loosening and tightening the tensioning screw. 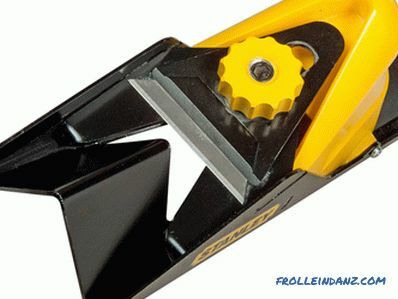 The edging cutter is used to trim the edges of edges to create chamfers. In this case, the angle of inclination may be 22.5 or 45 degrees. 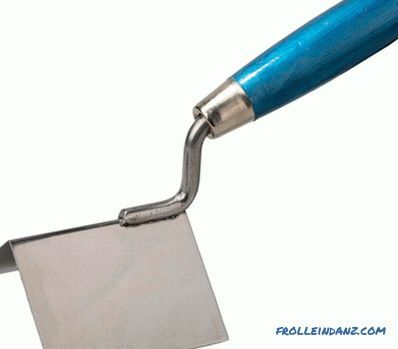 Before using the edge trimmer, the ends of the sheet must be leveled using a peeling planer. 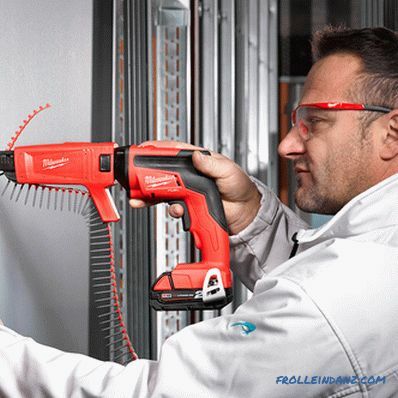 A special drill bit allows you to make standard holes in plasterboard that are necessary for mounting all kinds of communication elements. Such products are mainly sold in sets and have a different diameter, which makes it possible to choose a cutter for a specific purpose. This tool also creates holes. It is assumed that their variable diameter, which can vary in the range of 12-320 mm. 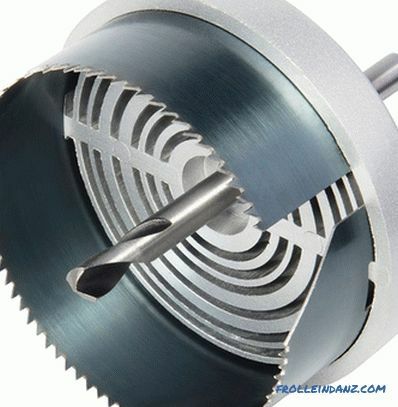 The device consists of an aluminum body and a highly durable cutting element in the form of a roller made of carbide materials. This fixture is used exclusively in cases where you need to give the material an arched shape or create another kind of curved surface. Water is applied to a sheet of drywall, which in the process of perforation penetrates directly into the body of the plaster layer. The depth of the holes is 5-7 mm, and their diameter varies between 2-3 mm. In this case, the side on which the grooves are made should be concave. The tool will be needed during the profile cutting process. 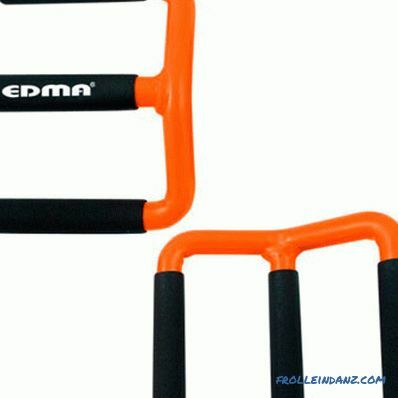 This is a great alternative to the hacksaw, which is not always convenient to work in certain conditions. These primarily include Bulgarian and jigsaw, which in some cases can significantly simplify the work. 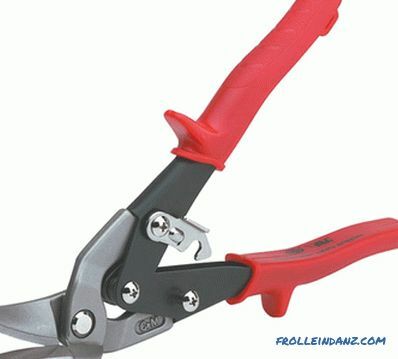 Also not superfluous will be electric shears of small size, allowing to reach hard-to-reach places. 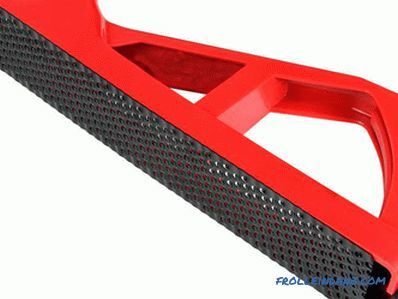 It is often necessary to pierce the holes necessary for laying various communication elements in the metal frame. 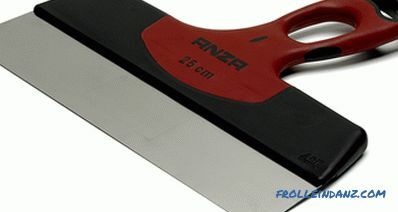 A cutter is a way to make holes with a diameter of 25 mm in a profile 1 mm thick. This device is used to fasten the profile when mounting the frame. 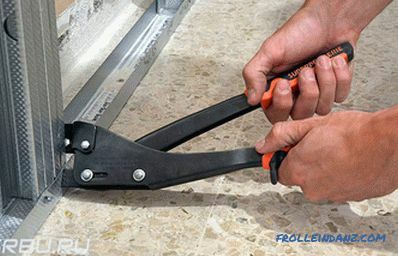 It allows you to connect profiles by the method of cutting with a bend, without using additional fasteners. For reliability of fixation, several cuts are usually made, the distance between which is about 5 mm. In this case, compared with the use of rivets, the surface of the frame remains perfectly smooth. It is intended for fastening metal protective profiles on the outer corners of partition walls from cardboard sheets. Usually on sale it is additionally completed with a rubber hammer. Fixing of PU-profiles occurs mechanically. A tool familiar to almost every man, used to drill holes in a variety of building materials, including gypsum board and gypsum plasterboard. It will be necessary, first of all, for drilling holes in dowels when fixing profiles, as well as when installing sockets and switches. For drilling metal construction elements it is recommended to use special drills with a conical sharpening. 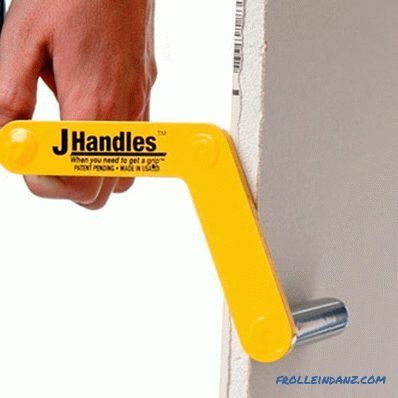 Since it is possible to adjust the tightening torque when working with this tool, it is almost impossible to accidentally damage the drywall you are installing. The motor will be stopped in a timely manner. Improved models, created specifically for work with GCR, differ in rotational speed, which reaches 4000 r / min. 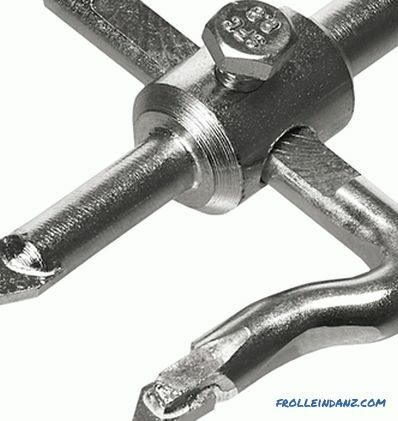 This makes it possible to quickly and effortlessly twist the screws into the metal elements of the structure. 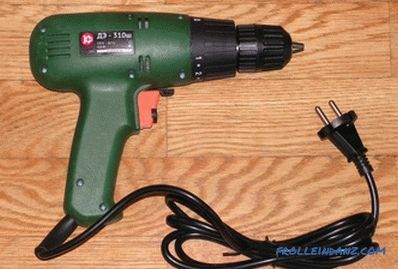 In such tools, a stepped method for adjusting the screw depth is provided. 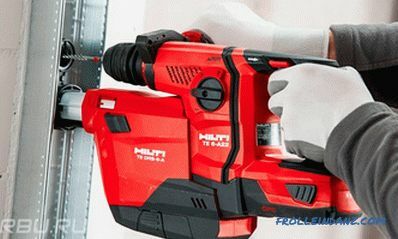 Today, you can purchase both a network and a cordless screwdriver model, as well as various sets of bits. 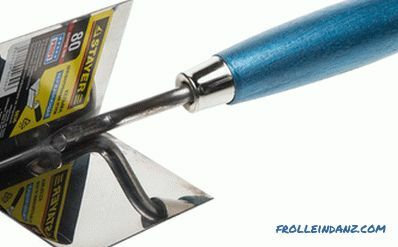 Tools designed for kneading and applying various putty mixtures used for gypsum board and gypsum plasterboard, usually made of stainless materials able to resist corrosive processes. The quality of the finish, first of all, depends on compliance with the technology of mixture preparation. 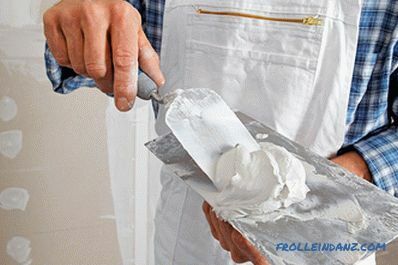 Mixing putty can be done with an electric drill or use a special mixer. All nozzles for mixing solutions have their own design and purpose. The nozzle with a round spatula is designed to work with dispersion paints, sealants and adhesives. The spiral nozzle with the ring will be needed to knead the filling mixtures, leveling materials and plaster. Left-handed spiral nozzle, which has three branches, is mainly used for liquid mixtures characterized by a fairly low density. A spiral nozzle with a right-handed helix, most suitable for heavy mixtures that have a higher degree of viscosity. A screw nozzle with a ring is used for mixing liquid materials: primers, varnishes, adhesives, and mixtures intended for spraying. 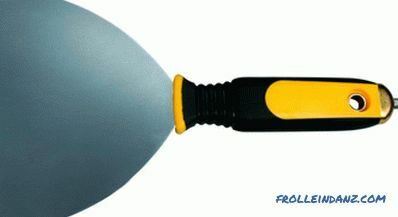 A spatula of 50–70 cm in size is ideal for sealing seams. They are convenient to embed reinforcing tape, which are mounted on the seams of gypscoarton, as well as putty putty mixture along the seam. 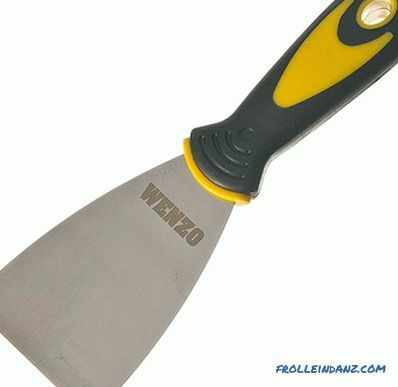 When mounting the cut edges, non-standard seams are often formed, for the quality processing of which it makes sense to purchase a large spatula. 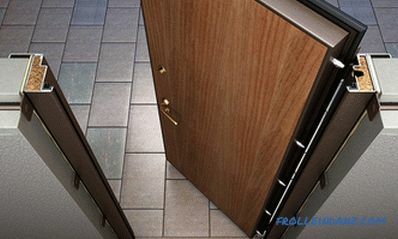 In addition, there are special tools designed to work with inside and outside corners. These spatulas have special shapes. 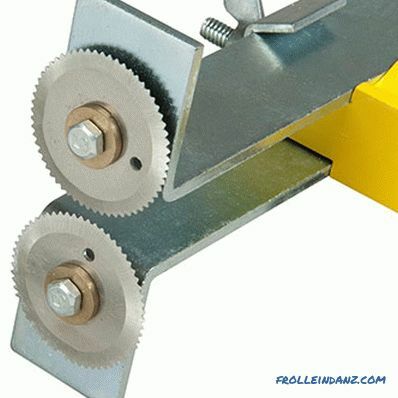 This fixture is used to putty up the joints of gypsum-board plates and the recesses of the remaining screws. In this case, when puttying the grooves of the screws, it is possible to quickly correct the existing defects in the installation of drywall in those places where the heads of the screws protrude above the surface of the drywall sheet. 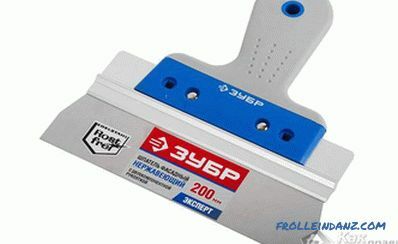 For continuous filling of the surface of gypsum boards using wide spatulas of 180 cm and more in size. Also during the puttying process, a metal shield with which it is convenient to bring putty material ready for use to the work site will not be superfluous. 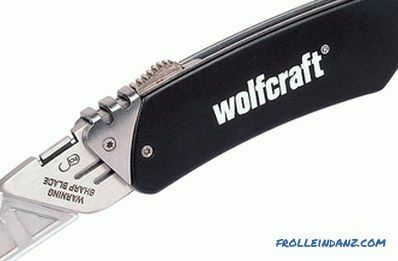 This is a fairly lightweight product, equipped with a perpendicularly located handle. The product in the form of a plate, equipped with special clips to replace the mesh, is used in the process of dry grinding processed putty mixture of sheets of gypsum boards and seams. 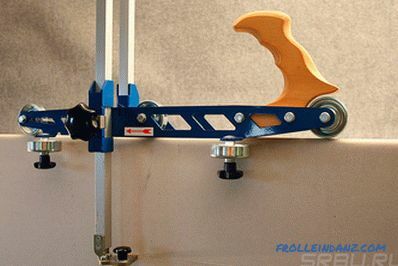 Here, in addition to the clamps, there is a cutting that is fixed by the hinge method. The tool is intended primarily for working with hard to reach places. If necessary, the handle can be independently extended, thus increasing the range. This will allow the master to be outside the area with the highest dust generation. These devices allow you to speed up the surface cleaning process, which is caused by a rather high frequency of vibration. In addition, such devices are able to absorb dust, which is accumulated in a special dust collector.